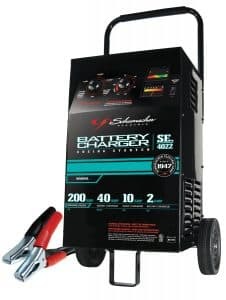 A reliable battery charger is a must-have if you want to avoid the frustrations brought by a dead battery when you critically need to use your car or motorcycle. You’ll have to choose between an automated and manual charger. While they’re both designed for the same purpose, an automated charger is way safer for your battery. Other considerations include the price, durability, safety, and versatility. Go through the below review to find out the best car battery chargers. 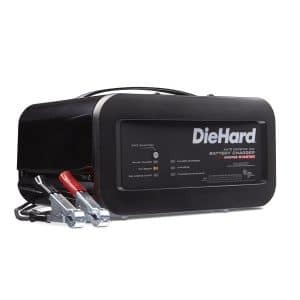 DieHard 71323 battery charger using intelligent charge technology which features 10 Amp boost for a quick energy and 50 strong amps of jump starting power. It features an ingenious design to safely charge your car battery meaning it prevents overcharging by monitoring and switching to maintenance mode when fully charged. It features high-quality components and a sturdy construction that allows it to withstand water and dust confidently. The LED Indicators and Buttons allow you to conveniently select your rates which include Charge, Boost and Engine Start. Schumacher battery charger is a manual charger designed to fit both the 6V and 12V batteries. This multifunctional unit will also analyze and detect problems with your car’s electrical and starting problems and do battery testing. It’s wheeled for easy portability. It uses trickle charging to charge a 12 battery charge in 2 to 12 hours. 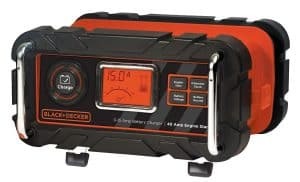 Black and Decker is a high-tech 3 stage battery charger that has been designed to last while maintaining and conditioning your battery. Black and Decker BC15BD is extremely easy to use. Unlike the manually operated chargers with numerous settings to do before they’re fully operational, this is a one touch unit. It’s equipped with an LCD display that’ll inform you of the charging status and incorrect terminal connection at a glance. Schumacher SE-5212A is a lightweight, handheld and highly portable device. At the touch of a button, its 50-Amp mode will revive your dead battery and put you on the road in a matter of minutes. This is an easy-to-use model, fully automated and very safe for your car, motorcycle, and boat battery. 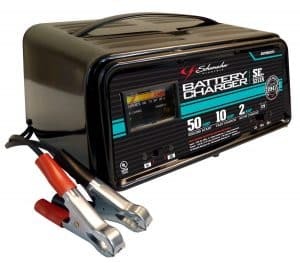 Schumacher SC-100330A is a giant charger and maintainer. It’s affordable and has all the essential features that we’d require for a car battery charger. This is a unique charger with a touchpad from which you can select the battery being charged and 2 charging modes. 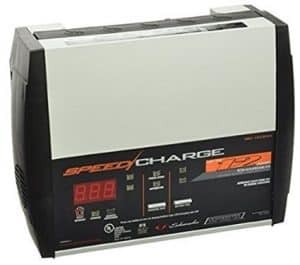 This battery charger comes with a built-in 100Amp engine starter ideal for almost any type of automobiles. Schumacher SC-1003A also has a desulfation capability which maintains your battery for optimum charging and charge storage. This battery charger from Suaoki features the Automatic Voltage Dectection for dectecting whether your battery requires 6 or 12-volt charging and features preprogrammed 8-stages charging process: Qualification, Pulse, Recodition, Bulk, Absorbtion, Full, Analysis and Maintenance. The LCD screen displays real-time charging voltage and battery bars letting you know about the battery charge status. When the battery is fully charged, it will automatically minimizes the current and turn itself to a battery maintainer. The charger is also waterproof (IP65) for longer use time. 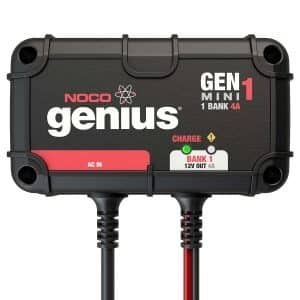 Noco Genius Battery Charger is an anti-spark and can, therefore, be used easily. It’s lightweight and 2 times more efficient than the manually operated chargers. This automatic charger is not only safe for your battery but also repairs dead discharged batteries. It’s also one of the most versatile batteries we came across in our hunt. It’s superiorly designed for use on almost any type of battery no matter its chemistries or size. Noco Genius Genmi is also 100% waterproof, and its price is unbeatable. 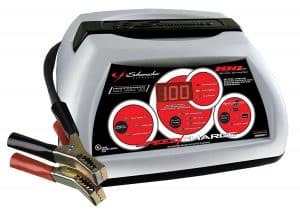 Schumacher SC-1200A-CA is another reliable 12A and 6A car battery charger you can’t ever go wrong with. It’s fully automated and has several charge modes namely tester, maintenance and full charge. It automatically detects the size of the battery and adjusts the charging amperage without overcharging or overheating. Its retractable handle makes it super easy to carry. 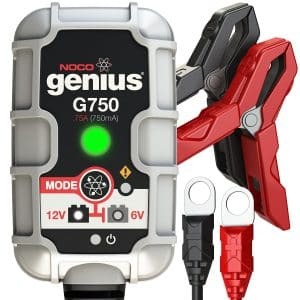 Noco Genius G750 is twice faster and more durable than chargers thrice its price. This is a compact, lightweight, and portable charger designed to charge, repair, and improve your batteries’ performance thanks to its inbuilt microcomputer. Its sturdy construction is both water and UV proof. 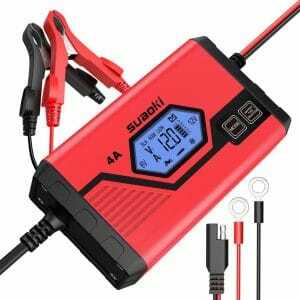 It’s time to have yourself the most advanced, compact, lightweight, budget-friendly, and heavy duty battery charger that today’s mechanics will die for. It’s a 1.25Amp unit with twice as much power and protection capabilities than ordinary 3 amp chargers. Its robust and durable construction requires no maintenance. Deltram Battery Tender charges your battery in 4 simple and battery friendly stages. It doesn’t use trickle charging, and it’s flashing LED lights will inform you when your battery is good to go. 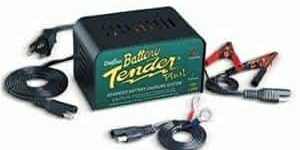 Deltran Battery Tender is an outstanding charger due to its versatility, safety, and pocket-friendly price tag. Say goodbye to battery drained by choosing the above-mentioned battery charger which will best suit your need.